Finding a cure for Diabetes is not something I typically get fired up about. I tend to feel bitter about the chances of anything ever actually happening on that front, so I choose to care about other, more tangible, things instead. Then my daughter wrote a short essay on who her role model is. She named her dad, and that she'd like to do something to help find a cure for Diabetes. It made me think. And my heart softened a bit. If my child cares about something, I do too. I can't not be supportive of my children's hopes and desires. "Supportive" is probably one of the top three things moms are. I could never in good conscience squash Camryn's idea that she might be able to help in some way. I can't say, "There's no use, dear, it just won't happen. Forget about it." You don't take away a person's HOPE, no matter what you think. Instead I said, "That is a wonderful thing. I love your sweetness and compassion and I am in your corner." Then I wondered, what can she do? What can we do together? So I looked up the Washington state chapter of the American Diabetes Association and discovered a local Step Out for Diabetes Walk happening on October 4. I asked Camryn if she would like to participate in the walk and she said yes. I hesitated in registering us, though. Partially because of how whimsical kids can be, partially because of all the extra STUFF we've been dealing with this year. Does she really want to? Will she follow through with me on this? Is this something we should take on considering everything else? About a month later I brought it up again and Camryn was still into it. She assumed I had signed us up already and pretty much told me to get on it! So I did. I took the leap and she and I are registered as a team for the walk. AJ may or may not also walk. Our team is called "Mark's Militia", suggested by my BFF. This is the very first time I've ever done anything like this, we can't actually put any money into it ourselves, so I set a low fundraising goal of just $500. Perhaps I underestimated the love and support of our family and friends, though, because they're donating more than I expected. And now I can't seem to adjust our fundraising goal higher, but I don't want that to stop anyone from donating. Yes, part of the reason for this post is to ask for more donations. 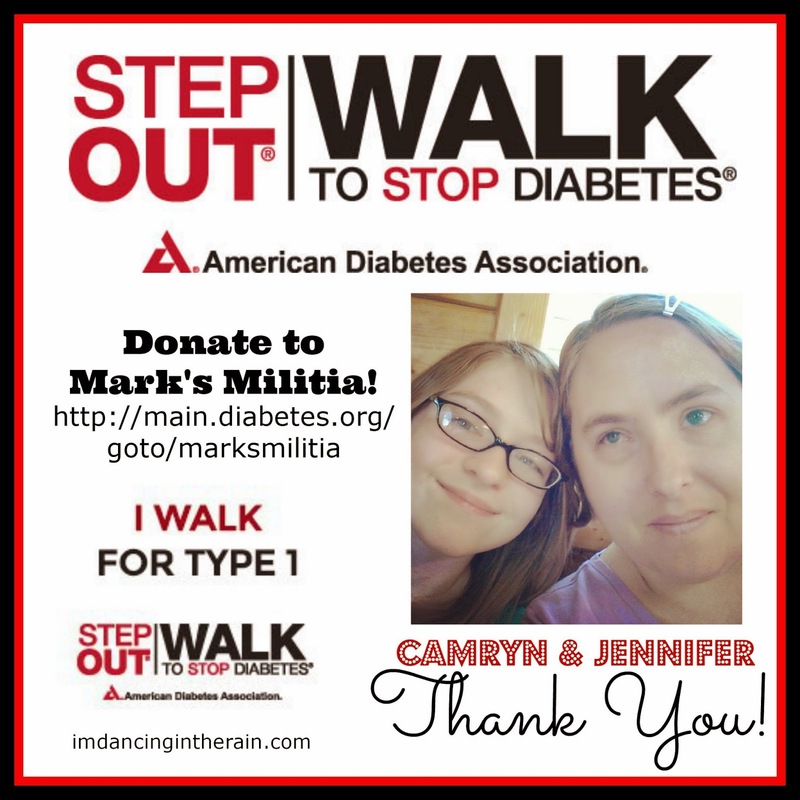 In just two short months, my kid(s) and I will do the Step Out for Diabetes Walk in Seattle's Magnuson Park, and it would be amazing to raise more money than I thought possible! As a little incentive, I'd like to offer you a deal: For every $20 you donate, I will place your blog button or ad (appropriate for my audience) in my sidebar for one month, letting everyone know that you're an awesome and generous Step Out Walk supporter! I'm excited to be doing this with my daughter. Will you do me one more favor? Will you share this post or the graphic above to help spread the word? Have you ever been involved in a charity walk?